I bumped into a trial lawyer acquaintance of mine at Starbucks in the CNN Center the other day. Somehow we got into talking about what litigators look for when choosing a jury. That’s when it hit me. 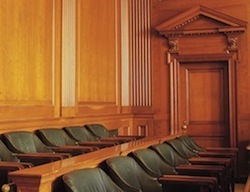 How to select a jury can help people in my business choose a target audience. And the lesson from jury selection is: the 18-49 age demo seems to make little sense. Its days are numbered as I approach my 50th birthday. The name of the trial lawyer who sparked my eureka moment is Stefan Turkheimer. He used to be with the DA’s office prosecuting felonies, including “a lot of meth trafficking.” Now he represents plaintiffs in personal injury and other cases. Turkheimer explained that, because it’s so hard to get 12 members of a jury to agree on a verdict, attorneys can’t possibly try to pick the right 12. Instead, they try to pick the right ONE. The ONE who has the potential to – and here’s the key word - INFLUENCE the other 11 jurors. The ONE who can “marshal the troops in the jury room.“ That ONE, you hope, you’ll be able to persuade. How old does that someone tend to be, I asked Turkheimer.